A project I worked on recently needed to integrate a WP blog into a site on a platform that did not allow access to any part of the back end. This did the trick. Kind of ran across this by accident today. I have looked for solutions for this from time to time and always ended up using some sort of hack, but this works, no hacks. I need this when I want a rectangle to keep it’s ratio without having an image nested inside, but instead using the image as the background. Use case for this today was a responsive Flexslider implementation with a different set of images with different ratios shown with a media query for smaller devices. This works with and without box-sizing but if you look at the element in your inspector, box-sizing makes more sense. There may already be a solution or the same post somewhere else, if so, let me know. Squeeze your browser and check it out. I didn’t test in every browser. I recently had to deal with a client’s site on shared hosting that was returning a 500 error. After a little diggining I found the offender was the .htacess that comes with HTML5BP. I ALWAYS forget this so I am posting it for myself and anyone else who stumbles upon it. 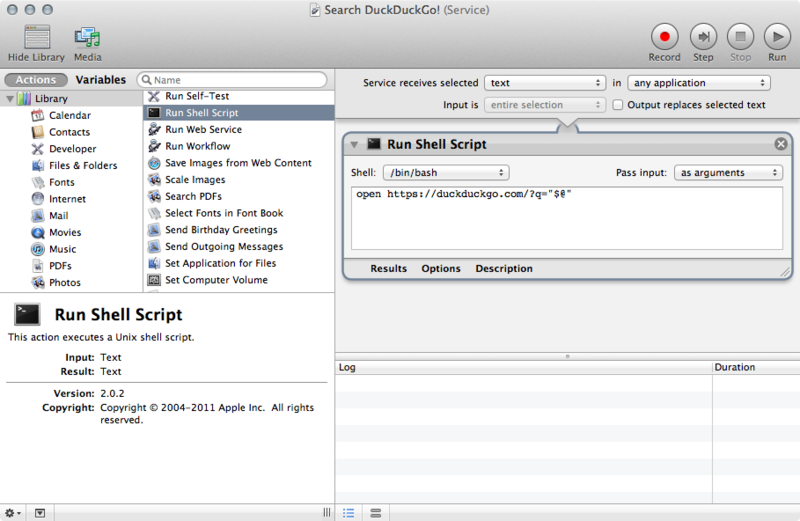 DuckDuckGo Automator Script for control-click search. I have never made an Automator script before today, but I needed something. If you use DuckDuckGo and don’t want to get too crazy about adding a search option on your contextual menu, you can create this script to add a feature just like the default “Search in Google/Yahoo/Bing”. Open Automator and choose File > New and choose Service. Scroll the left pane down to Run Shell Script and drag it over to the right pane. You should be able to figure out the rest by looking at the example. Once you save the script, it will appear when you select text and control-click. Depending on how many services are on your machine, it may be under the Services menu.